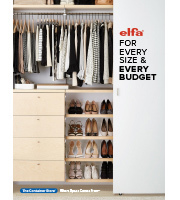 Use our exclusive Elfa Utility Boxes to organize and compartmentalize small items such as craft and office supplies, hardware, kitchen gadgets...and so much more! The translucent frosted plastic provides visibility and allows light to pass through. Three modular sizes can be used interchangeably to customize your solution. They're designed to work with our Elfa Utility Boards on our 4" and 10" Shelf/Trays or 4" Board Tray. 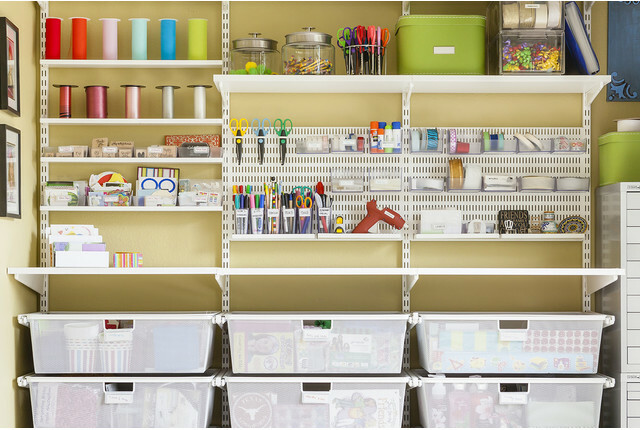 Add Label Holders (sold separately) to help identify what you've stored. Long items such as lumber, skis or surf boards are easily stored on a pair of our exclusive Bracket Posts. They snap easily onto a pair of Ventilated Shelf Brackets (sold separately) and are used in conjunction with Elfa Standards or Elfa freestanding Uprights. Keep lawn tools and power cords neat and accessible with our exclusive Elfa Utility Lawn Equipment Hook. It can be mounted directly to a wall stud or used in conjunction with an Elfa Track. Will these fit in the white elfa utility mesh baskets (narrow medium and large sizes) that fit on the door rack? All three of our elfa utility Boxes will fit in our elfa utility Large Basket. Our elfa utility Narrow Medium Basket will only accommodate our elfa utility Tall Box. Are these boxes dishwasher safe? Made from food-safe SAN plastic, our elfa utility Boxes are top rack dishwasher-safe.